May 31, 2010  The U.S. is not a part of the International Criminal Court and unlikely to sign up anytime soon, but the Obama administration is making an effort to cooperate more with it. Top State Department lawyers are taking part in a review conference meant to take stock of the court's proceedings so far. The court needs countries to help get some of the indicted war criminals to face trial. Another issue to be discussed is how the court defines "aggression." U.S. officials are worried that the U.S. could be exposed to prosecutions if the crime of aggression is too broadly defined. May 28, 2010  Philip Alston, the United Nations special rapporteur on extrajudicial, summary or arbitrary executions, is expected to call on the U.S. to end the use of CIA drones to attack al-Qaida. The strikes have been blamed for civilian deaths. Alston argues the U.S. military is much more accountable than the CIA for the deaths it causes. May 20, 2010  Addressing a joint meeting of the U.S. Congress, Mexican President Felipe Calderon appealed Thursday for an overhaul of U.S. immigration policy, urging lawmakers to fix what he called a "broken" system. He also said the drug war would be helped by tighter U.S. rules on assault rifles. 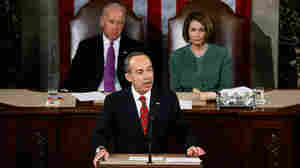 May 20, 2010  Mexican President Felipe Calderon addressed a joint session of Congress on Thursday, and urged U.S. lawmakers to overhaul the immigration system and consider reinstating a ban on assault rifles. May 19, 2010  Mexican President Felipe Calderon is in Washington for a state visit, complete with South Lawn arrival ceremony, a joint news conference with President Obama, and a state dinner. Topping the agenda: Mexico's bloody war with the cartels, and anti-immigration sentiment in the U.S., exemplified by Arizona's harsh new law aimed at illegal immigrants. May 18, 2010  A day after Iran agreed to ship some of its low enriched uranium abroad, the Obama administration announced that it is moving ahead with sanctions anyway, aimed at compelling Iran to rein in its suspect nuclear program. Secretary of State Hillary Clinton says she thinks Iran only agreed to the fuel swap deal to derail the sanctions effort -- and she says that Russia and China are with the U.S. on this. May 4, 2010  The United Nations was the scene of a diplomatic clash between the United States and Iran Monday. Iran's president showed up for the opening of the Nuclear Nonproliferation Treaty review conference. Secretary of State Hillary Clinton accused him of trying to divert attention away from Iran's record of violating its international obligations. May 3, 2010  Iran's President Mahmoud Ahmadinejad addressed the review conference of the Nuclear Non-Proliferation Treaty in New York on Monday, as the U.S. and its allies push for more sanctions over Tehran's suspect nuclear program. April 26, 2010  The world's only leader wanted by the International Criminal Court for crimes against humanity won a decisive election victory. But the U.S. says if Sudan's Omar al-Bashir thinks he can get any more legitimacy from the vote, he's wrong. Activists want the Obama administration to be much tougher with Bashir, and learn some lessons from the widespread allegations of fraud in the recent elections. The next big vote will be a referendum on whether the South will secede. It is all part of a peace deal the U.S. helped negotiate to end a war between the North and the South. April 18, 2010  The Obama administration has been reaching out to the new interim government in Kyrgyzstan, in hopes that the U.S. will continue the use of an air base there to supply troops in Afghanistan. But the opposition leaders now in power in Kyrgyzstan complain that their ousted president's son was enriching himself from contracts at the airbase. The U.S. says it will review the contracts, but the same allegations of cronyism occurred the last time there was an uprising in Kyrgyzstan. April 14, 2010  President Obama's nuclear security summit was about keeping nuclear material away from terrorists. On the sidelines of the meeting, the talk was about Iran. With leaders from nearly 50 countries present in the convention center, there was a rare opportunity for Western powers to lobby other nations to join the international campaign against Iran's nuclear program. April 12, 2010  The Nuclear Security Summit is about securing fissile material. But on the sidelines, many diplomatic stories are playing out. President Hu of China and President Obama meet in a sign of warming relations. Indian Prime Minister Singh meets Mr. Obama, another sign of strengthening ties. And where's Israeli Prime Minister Netanyahu? April 11, 2010  Leaders from dozens of nations around the world will gather in Washington this week to talk about nuclear security. President Obama has made that a priority, saying he's taking steps toward a world free of nuclear weapons. That's his long-term vision. This summit will deal with more immediate issues, like how to keep nuclear materials out of the hands of terrorists. 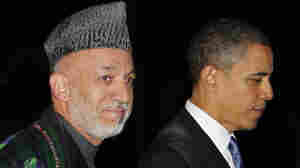 April 8, 2010  Afghan President Hamid Karzai and the Obama administration have had a tense relationship from the start. But it seems to be worsening, as Karzai lashes out against U.S. pressure on him, and the U.S. urges caution if he still wants to meet with President Obama in May. April 7, 2010  President Obama is limiting the circumstances under which the U.S. would use nuclear weapons. The Nuclear Posture Review was a year in the making and breaks from previous reports. Some arms control advocates say the president is taking a cautious line, even though he often speaks about his efforts to move toward a world without nuclear weapons.